I want to share with you an ensemble that I just finished for Dianna Effner’s Little Darlings. It is pure pink princessy-ness; a color that all (well, most) little princesses love. Gina loves her crocheted purse with fun dangles to hold her tiny treasures. For more information on Gina’s “My Princess in Pink” ensemble please visit my “Available for Sale” page on cindyricedesigns.com . This entry was posted in Beads, Crochet, Doll Dresses, Effner Dolls, Embroidery, knits, little darlings, Purses, Sweaters, White and tagged beading, cardigan, crochet, doll dress, doll sweater, effner, embroidery, knit, little darlings, sweater on April 16, 2015 by Cindy Rice. Do you have any snowflakes yet? We don’t have any real snowflakes in northern Illinois. In fact it just got cold enough to produce snow, not rain. I am sure it won’t be long now and we will be enjoying the quiet beauty of a winter wonderland. To celebrate the start of winter Talyssa has a new ensemble to show you reminiscent of an icy paradise where she is the princess. Her dress is made with a cotton print in violet-ish colored snowflakes. 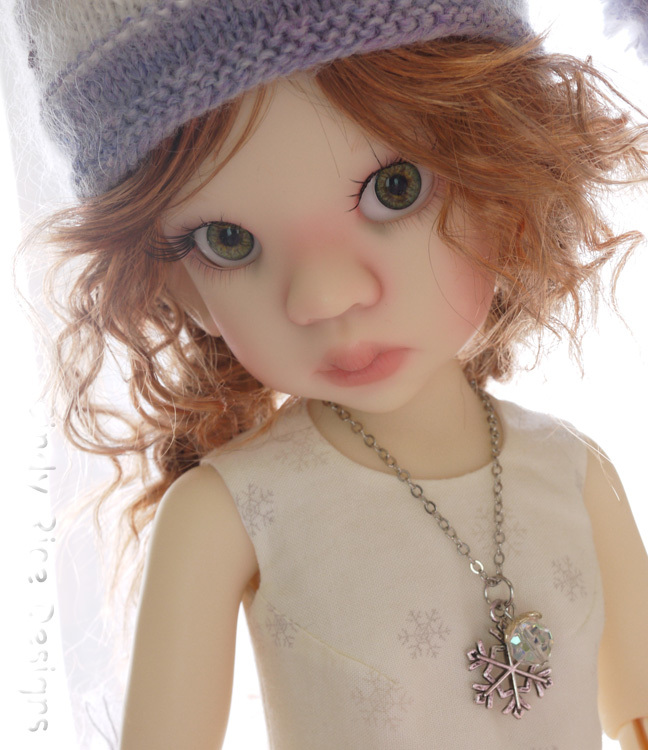 Snowflake embroidery, crystals, pearls, a silver snowflake charm, a glittery ornament, muted shades of color (or no color) make Talyssa’s new outfit perfect to help welcome winter. For more information on Talyssa’s “Winter Snowflakes” ensemble please visit the “Available for Sale” page on cindyricedesigns.com . 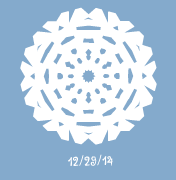 If you’d like to make some of your own (virtual paper) snowflakes you can make some online here. I love the sound affects as the snowflakes are being snipped. Here’s the one I made. This entry was posted in Beads, Doll Dresses, Doll Hats, Doll jewelry, Embroidery, Kaye Wiggs, Sweaters, Talyssa, Winter and tagged beading, cardigan, dress, embroidery, Kaye Wiggs, snowflakes, stocking hat, sweater, winter on December 31, 2014 by Cindy Rice. Red striped candy canes as we know them now have been the official Christmas candy since about 1900. (Before this time they were solid white.) But only recently, it seems, every company has a candy cane variation for their products i.e., Candy Cane Oreos, Ghirardelli peppermint bark, Starbucks drinks (too many to list), Dairy Queen Candy Cane Chill Blizzard, etc. etc. Since all of the above will ruin a diet here is my Little Darling, Gina, modeling a no calorie version starring the candy cane. For more information on this “Candy Canes for Christmas” ensemble for the Little Darlings please visit my “Available for Sale” page at cindyricedesigns.com . So, what are your favorite treats in candy cane flavors? This entry was posted in Beads, Christmas, Doll Dresses, Doll Hats, Effner Dolls, Embroidery, Knitting and tagged beading, christmas, doll dress, effner, embroidery, knitting, little darlings on December 8, 2014 by Cindy Rice.